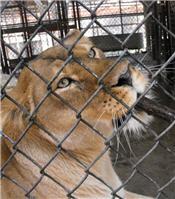 We met Eve in Poetry TX after we received a call to help 20 exotics cats find new homes. What we found when we arrived was one of the most appalling situations we have ever walked into. Eve and her sister Layla were two of the luckier ones at this private resident. Eve lived outside in an area that was actually larger than any of the other cats had, but was also evident that the care they received was no different than any of the others. The water was so green that you couldn’t see through it and was obviously contaminated with feces. There was no way to lock the sisters up so that we could get in to clean the water or the mounds of feces and old bones. We had to come up with a way we could siphon the water thus getting fresh water in for them. Along the outside of their cage was a small den where we found 3 skulls that we believe to belong to two older lions and one younger lion. Once we were able to get into the cage we were able to clean up the remaining piles of bones which we believe to be from carcasses of deer. Eve is actually a very large and muscular female hence her Barbary traits. She is the only one that wasn’t declawed. We affectionately call Eve our little linebacker. Eve is a little more cautious than the others but seems to be the first to figure out things. Our plan is to spay Eve and Layla and to integrate them with Aramis and Aurora. The Barbary Lion, Atlas lion or Nubian lion (Panthera leo) is a subspecies of lion that has become extinct in the wild. There are around 40 in captivity in Europe, with fewer than a hundred in zoos around the world. The last known Barbary lion in the wild was shot in the Atlas Mountains in 1922. The Barbary lion was believed to be extinct in captivity as well. However, possible Barbary lion individuals or descendants have been located in zoos and circus populations within the last three decades. The Barbary lion is often considered to be the heaviest of the lion subspecies; the calculated weight for the males is 440-600 lb and females 260-400 lb. Some experts, however, have expressed the belief that such weights are greatly exaggerated, and that the Barbary lion was similar in size to the lions in East Africa.